Though admitting that the controversial billboard recently erected in Road Town is a bit unsettling, Premier Dr D Orlando Smith has dismissed the persons who commissioned the advert as ‘petty’. 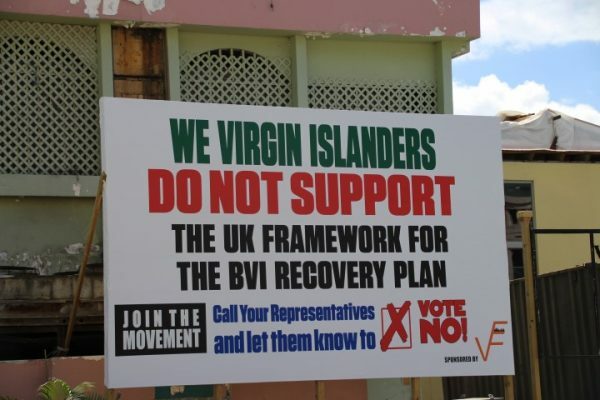 The sign is implicitly calling for a referendum of some kind, in which Virgin Islands natives can put the proposed BVI recovery plan and its contents to a vote. “I think everybody else in this country understands the need to rebuild, especially those who were affected. And they all understand too that we need to have the finances in order to rebuild. And I think everybody in business understands that if we are going to borrow money, there are terms and conditions to borrowing that money,” Dr Smith said at a press conference recently. He noted that the billboard could have been commissioned by anyone, including persons within his own National Democratic Party (NDP). Though that may be, Dr Smith said he does believe the persons responsible for the billboard are NDP supporters. BVI News captured a photograph of this billboard near the roundabout in Road Town on Wednesday, February 28. Late last month, the billboard in question was mounted near the roundabout in Road Town. The sign is calling on locals to not support the United Kingdom’s framework for the post-hurricane Recovery and Development Plan. Ever since it appeared, it has been stirring up controversy in the British Virgin Islands and those responsible have only identified themselves as VE Virgin Islanders. 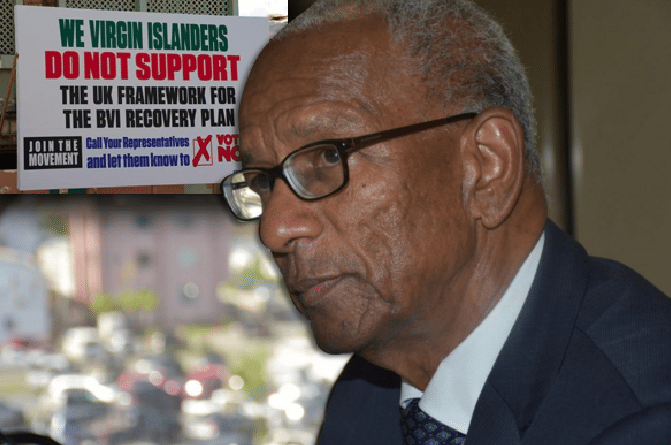 They erected the billboard just days after Premier Dr D Orlando Smith declared that the BVI is still in control, though the UK Government appears to be tightening its hold on the territory. I said sometime ago that bvislanders are their own worst enemy. The way they treat their own people is deplorable. I am not a political person but things like this divide a country. Now is time for all to work together. Leave the petty nonsense out. @daniel. Speak for yourself. However, you must add, “hopefully” victimization is a thing of the past somewhere in your comment, because people are being stripped of their duties- left, right, and center, whether party affiliated or not. These are disparate times in our political history and our politics will either get better or worse because of it, particularly if everyone does not become engaged in the collective direction of our country’s future. People are entitled to their opinions (even if they are dead wrong), but they should come out from the shadows. If you are not ashamed to say it, then stand up and say it. Don’t post anonymous billboards. That is just cowardly and tells the world when the chips are down you don’t stand by what you are saying. It is ironic that those who call for Government in the sunshine like to operate in the shadows. If they had an alternative to what the UK proposed I wouldn’t mind, but to just say vote NO to something without providing context or alternative solutions to the problems that makes no sense. These will be the same people saying the recovery is not moving fast enough when the only way we can recover is with the necessary funding to do so. I swear some of us sat on our heads in class and passed out before the lessons were taught. A REAL leader is supposed to be able to ignore this as a mere irritation. Over the years I have seen them get increasingly bothered, worked up an agitated by things that are trivial, petty nonsense. …run the country and do not concern yourselves with this. The Lion does not concern himself with the opinion of sheep. I see the same poster is posted on Skelton’s electronic sign in Fish Bay ! He must know who put it up !! seems like our Premier is at his wits end in his own political party. Politics is, as politics will be. Let the games begin. He going fire someone, just watch. The VI was decimated by 2 Cat 5 hurricanes, Irma and Maria, in September 2017. The extensive devastion include damages to personal residences, businesses, government facilities, tourist facilities, infrastructure……etc. Further, the twin pillars of economy, financial and tourism, especially tourism, were also devastated by the storms. It will take considerable financial resources and time to recover from the damages. The estimated recovery cost is $3.6B; this cost is approx 3.5 times the national GDP, which is approx $1B. Moreover, the recovery has to be funded but the BVI does not have the money in unreserved funds nor can it be funded in a timely manner through revenues; pay as you go is not a viable option. Consequently, money has to be borrowed and paid back over the long term. Thus, the major issue should be the priority of the projects, source(s) for loan, loan payback, payback period and opportunity cost projects. Moreover, the proposed $721M capital expenditure over 5 years appears to be the 1st phase of the recovery effort. Further, the UK provided a £10M ($13M) grant and is willing to provide £300M ($402M) of loan guarantee. The UK as the Mother country is imposing some terms and condition for borrowing recovery loans. Is the UK as the Mother country responsible for loans incurred by OTs? If yes, is it not reasonable for it to set reasonable terms and conditions for borrowing money? Typically, the lender sets terms and conditions for loans that the borrower can accept or decline. Clearly, there are different opinions and concerns on the amount of the proposed loan, terms and conditions, payback…….etc. The bottom line is the territory needs to be rebuilt and it has to borrow the money to do it. Residents needs to cooperate, collaborate, comprise…….etc on the way forward. Exactly! We either do like Cayman and take money from a Billionnaire and scratch his back to his tune or we borrow with UK underwriting on their terms. We don’t have oil, gold etc. so I don’t know why we are acting as if we have a choice in the matter. Everyone agrees we need to rebuild, everyone agrees it takes REAL MONEY to rebuild now people making noise about the UK funding but not giving alternative financing for the rebuild? How helpful is that. If the Premier would come out and keep the people informed then these things won’t happen. Real talk. Two things are indisputable. One, the BVI needs to be rebuilt. And two, it has to borrow tens of millions of dollars to do so. Without the borrowing to invest on rebuilding, the BVI growth and development will stagnate. And residents quality of life and standard of living will be degraded. We are not going to desist.